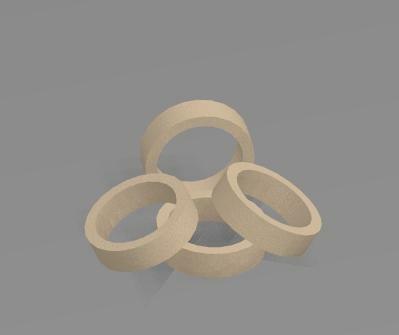 This is a 4-pack of BT-50 Centering Rings for use with an A/B/C Engine Tube (sfr811000). This item is fully Estes compatible. Retail $0.79 SAVE 25% ! Inside Diameter: .745" +/- .003"
Outside Diameter: .942" +/- .003"
"Heavy Duty BT-50 Centering Rings Uses Other Than...."
I have used these centering rings for centering BT-20&apos;s in BT-50&apos;s, but they can be used for engine blocks for 24mm D, or E motors. Single ring for D motors and double rings for E motors will be sufficient, if epoxy is used instead of wood glue. 4 BT-50 Centering Rings for an A/B/C Engine Tube. "Perfect for making engine mounts"
Makes two engine mounts that fit in BT-50 tubes. Very nice quality. "Excellent product to replace engines. has everything you nees to rebuild"
not much to say about centering rings, except that these fit and work like expected. I always seem to be short these when building.